"And whence is this to me, that the mother of my Lord should come to me?" The Visitation is took place when Mary visits her cousin Elizabeth. Considering this scene and looking at a picture, will help you meditate on this mystery of the rosary. Keep in mind also that the fruit of this mystery is love of neighbor. During the Angel Gabriel's appearance to Mary, he also tells her that her cousin Elizabeth is expecting a baby. Elizabeth is much older than Mary and was thought to be infertile because of her age and because she had no children. Gabriel reveals this to Mary to show that "no word shall be impossible with God" -Luke 1:36. After the Angel leaves, Mary visits her Cousin Elizabeth. Mary enters into the house of Elizabeth and her husband Zachary. When Elizabeth hears Mary's greeting she feels her child leap within her. Leapt for joy...notice here that St. John the Baptist, Elizabeth's child, is the first to experience the joys of Mary and Jesus. How special he is. My soul doth magnify the Lord. And my spirit hath rejoiced in God my Saviour. for behold from henceforth all generations shall call me blessed. to them that fear him. he hath scattered the proud in the conceit of their heart. and hath exalted the humble. As he spoke to our fathers, to Abraham and to his seed for ever. Notice that it is Biblical to refer to Mary as Blessed. It says so right in the New Testament, "All generations shall call me blessed." You obey this command when you pray the Rosary and especially when you meditate upon this mystery, the Visitation. Mary then stays with Elizabeth for three months. Surely she helps her cousin who was late in pregnancy. Elizabeth has a son and names him John. The Bible says that he is the prophet of the highest and that he prepares his way. 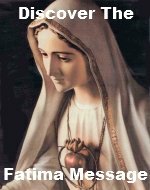 Meditating upon the mysteries of the Rosary and especially the Visitation, will direct your feet into the way of peace. The Bible passages for the Visitation were taken from the timeless Douay-Rheims Catholic Bible. If you are looking for a more modern language version of the Visitation, our recommendation would be the St. Ignatius Press Bible. If you would like to read the full scriptural account of The Visitation it can be found in Luke 1:39-56. Here are some additional thoughts to enhance your meditation on the Visitation Rosary mystery below. 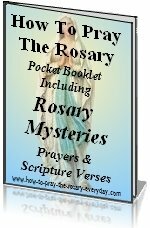 Also, a great way to meditate on the Rosary mystery is to pick one of the meditations below, then head over to our Rosary mp3 page and listen to the Rosary while meditating on a specific topic. You will also find our Joyful Rosary Video page helpful in your meditation on the Visitation. Return often to this page when you are praying the Joyful Mystery of the Rosary - The Visitation. This Bible verse is often heard at weddings but it can be better applied in the story of the Visitation. After Gabriel leaves, Mary goes "with haste" to help her cousin. She disregards herself and doesn't take into concern the difficult journey. She "bears all things" in her love for her cousin. Mary wants to share Jesus with others. The first person she shares Him with is St. Elizabeth. You too should follow Mary's example and share Jesus and His Church to those you love. The Visitation is the Pro-Life mystery. It is important to take note of this especially at a time when more than 1 million babies die each year by abortion, and as Euthanasia is sweeping across America. Elizabeth's baby "leapt" within her womb. The Bible here shows that it is unquestionably pro-life. This is not up for debate. An unborn baby is a baby and human life must be protected from womb to tomb. From the onset, God used Mary to channel graces from Jesus. These graces were first recieved by Elizabeth and John the Baptist and continue to be received by those who ask her for them. She is the storehouse of Grace. By the sound of Mary's voice, the Holy Spirit was conferred on St. Elizabeth and thereby on her child, fulfilling the words of the Archangel Gabriel to Zachary. Mary demonstrates kindness to family members and respect for elders in this mystery. When you read the full account of the Visitation, you see that Mary and Zachary are at odds. She says "be it done to me according to thy word." -Luke 1:38. Mary trusts and Zachary doubts. Mary's humility is once again demonstrated in this mystery for she did not praise herself by retelling the wonderful visit from Gabriel. Rather, Elizabeth sang Mary's praises. Then Mary responded by praising God in her prayer, the Magnificat. Dear Lord, help me to love and enjoy my immediate family and my extended family although there may be differneces in what we believe. Please give me the graces to be charitable towards my neighbor at home, at work and even at the store. In doing so, let it bring others to you through me.